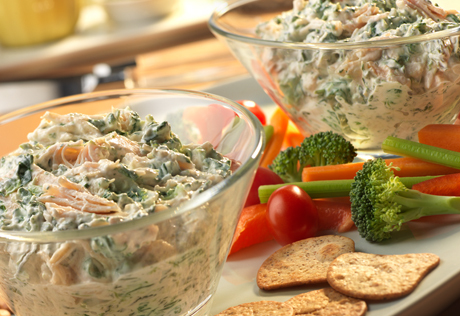 Your guests will really enjoy this tasty dip that combines a few on-hand ingredients. It’s as easy as mix, chill and serve! Grab some carrots and crackers and dig into a simply delicious dip that is sure to please. Stir the sour cream, dressing mix, chicken and spinach in a medium bowl. Cover and refrigerate for 20 minutes. Serve with the carrots and cracker chips for dipping. Alternate Preparation: To serve hot, stir the sour cream, dressing mix, chicken and spinach in a medium microwavable bowl. Microwave on HIGH for 3 minutes or until the mixture is hot. Stir before serving.